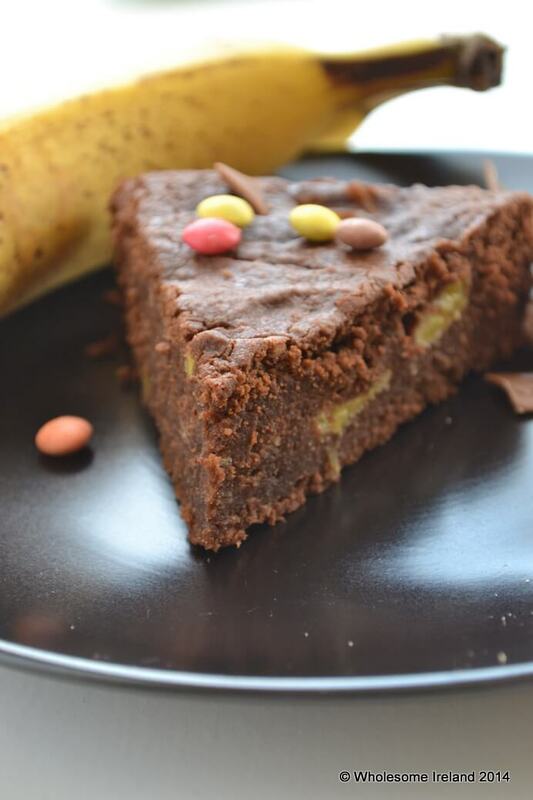 If, by chance, you have any chocolate left over after the excesses of last Sunday, you might want to consider making this chocolate banana cake. It’s cake, not banana bread, and will freeze for up to 2 months if wrapped well. Not that you’re going to want it to last that long! We had a lovely family get-together over the Easter holidays and it was great to see most of our extended family in the one place, all 4 generations! Grandad is now 97 and I have to share a wonderful interview that he did with Vincent Flood of Near FM a few months ago. Grandad is full of Irish cycling lore as he once cycled internationally for Ireland and it’s a great time to revisit the interview as the Giro D’Italia will visit our town next month. Click below to play. Preheat your (fan) oven to 160 degrees Celsius, grease and line 2 sandwich baking tins (I used 15cm diameter tins here). Place the chocolate & water in a small saucepan & heat very gently, stirring regularly, until all melted & combined. Put the butter into a mixing bowl & beat briefly, then add sugar and golden syrup & beat well. Add eggs one at a time, beating until light & fluffy. Sift your remaining dry ingredients together & stir into the wet batter (eggs, butter, sugar and golden syrup), then add the chocolate mixture and stir until it’s completely incorporated. Remove the skins from the bananas and break them into chunks before stirring very carefully into the batter (you want to retain some of the chunks). Divide the batter equally between the 2 lined baking tins. Bake at 150 degrees for 45 mins approx. The cakes are more dense & moist than a standard sponge, but will not be actually gooey inside. This cake is lovely with a dollop of whipped cream or a scoop of good vanilla ice cream. Oh dear god! Seriously what are you trying to do to us?! So do I take it that you don’t mush the banana up at all, just break it up or slice it? Sorry Lisa! Yes, just break it up with your fingers. Don’t get too caught up on how it looks but no need to mash. Looks delicious. Sounds perfect for my birthday next week! Do you combine the melted choc with the egg/butter/sugar mixture just before mixing it into the dry ingredients? Well Happy Birthday to you! I managed to muck up the punctuation above so I’ve amened the recipe to make the steps clearer! Smallest tins I had were 20cm so I multiplied the recipe by 1.5 and gave it an extra 10 mins in the oven. Looks good anyway – just hope it’s cooked in centre when I cut into it tomorrow! Mixture was yum before I cooked it anyhow! OK – the smallest tins I had were 20cm, so I increased the recipe by 50% and gave it an extra 10 mins in the oven. Not sure it was supposed to be quite that brownie-like in texture, but it tasted good and went down very well! Yum! I had given up on banana cakes, however, this is different and I think I’ll try it. Lucky for me that my grocer has golden syrup. Thank you for the recipe. No actually mixing the chocolate and water on a low heat. No Bain Marie. It doesn’t seize once it’s all melted. I hope that helps!